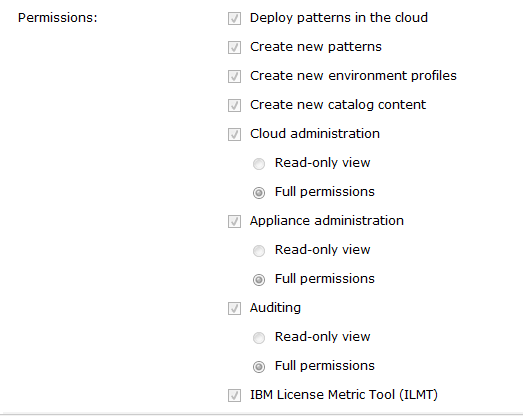 A User Management overview of the IBM SmartCloud Application Workload Service. In this short article,I will explain the basics of the user management capability of IBM SmartCloud Application Workload Service which is part of IBM SmartCloud Application Services (IBM SmartCloud Application Services is currently in pilot). This capability is also available on the IBM PureApplication System. In the IBM SmartCloud Application Workload Service, you can create patterns and you can grant access to these pattern to a number of users or groups of users; this is done via the IBM SmartCloud Application Workload Service portal. An administrator user exists, and you can create others to manage the user access on the platform. Conclusion: On the IBM SmartCloud Application Workload Service, you can fine-tune user permissions and secure the usage of your environment. This entry was posted in IBM SmartCloud Application Services and tagged #ibmcloud, #SCAS, #SCAWS, #smartcloudenterprise by ITDoVe. Bookmark the permalink.